Saltcellars like the one below, commissioned by Portuguese officers and exquisitely produced by West African carvers, held precious table salt. They would have been taken back to Portugal to be displayed in curiosity cabinets. Today their carvings serve as a record of the introduction of guns, Christianity, and European commodities to West Africa. By the 1880s European powers were interested in Africa’s resources, particularly mineral wealth and forests. Today, Africa is divided into 53 independent countries but many scholars argue that the boundaries that separate these countries are really artificial. They were drawn by Europeans at the Berlin Conference in 1884-85 without a single African present. They did not divide the continent by cultural or tribal region, but instead created borders based on their own interests. The problems this created—separating families, language groups, trading partners, pastoralists from watering holes, etc.—are still very much at issue today. African cultures never existed in isolation—there was always movement, trade, and the exchange of ideas. And logically African art is dynamic and has changed in form, function, and meaning over time. Nevertheless, in the Western art market and in academia, there exists the concept of “traditional” African art. Usually this refers to “indigenous art traditions that were viable and active prior to the colonization of Africa by European powers in the late nineteenth century. Implicit in the use of the word traditional is the assumption that the art which it describes is static and unchanging.” Many collectors and museum professionals place far greater value on African objects created prior to colonization. For them, pre-colonial objects have an aura of an untainted, timeless past when artists only made artworks for their own communities unaffected by the outside world. These objects are too often seen in opposition to work produced today using Western materials and conventions by artists who are engaged in a global discourse and who make works of art to be sold. In reality, some African art has always functioned as a commodity and artists have always drawn inspiration and materials from outside sources. 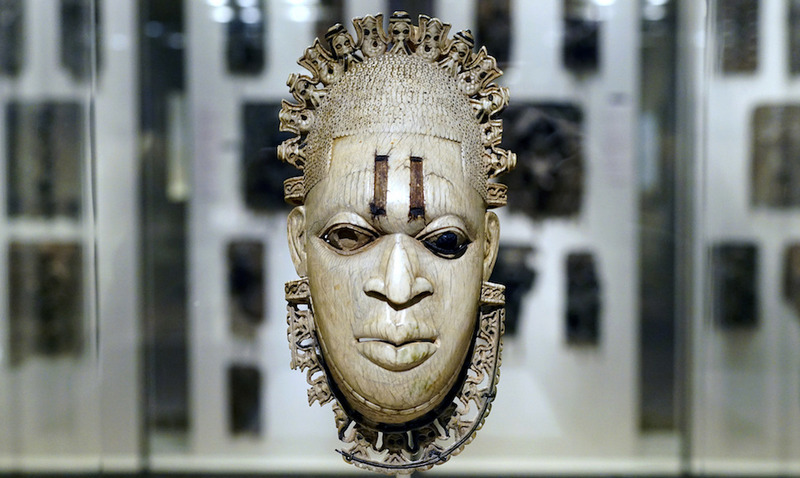 While many auction houses and art museums clearly differentiate between “traditional” African art created prior to the colonial period and artwork created during and after colonization, African art historians are beginning to dispel this simplistic division and instead, ask their audiences to recognize the continuity and dynamism of African art. Looking closer, scholars find that specific historical moments had a profound affect on African communities and their art. During the slave trade and colonization, for example, some artists created work to come to terms with these horrific events—experiences that often stripped people of their cultural, religious and political identities. One of the most damaging experiences for many ethnic groups in Africa was the transatlantic slave trade. While slavery had long existed in Africa, the transatlantic slave trade constituted a mass movement of peoples over four and a half centuries to colonies in North and South America. Ten million people were taken to labor on cotton, rum, and sugar plantations in the new world. Slavery coupled with the colonial experience had a profound effect on Africa and still causes strife. For example, Ghana has over 80 ethnic groups and during slave raids, different groups were pitted against one another—those living near the coast were involved in slave raiding in the interior in exchange for Portuguese and Dutch guns. Territorial disputes, poverty, famine, corruption, and disease increased as a result of the brutality of the slave trade and European colonization. 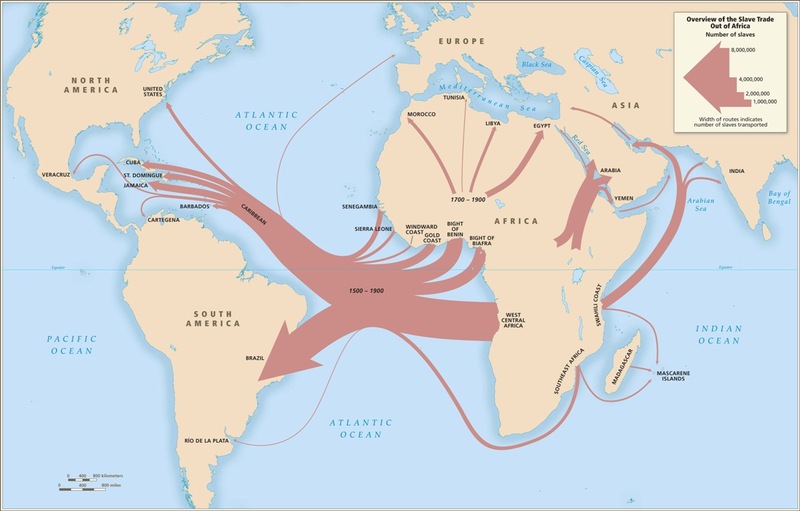 With the collapse of the Atlantic slave trade in the 19th century, European imperialism continued to focus on Africa as a source for raw materials and markets for the goods produced by industrialized nations. Africa was partitioned by the European powers during the Berlin Conference of 1884-85, a meeting where not a single African was present. The result was a continent defined by artificial borders with little concern for existing ethnic, linguistic, or geographic realities. European nations claimed land in order to secure access to the natural resources they needed to support rapidly growing industrial economies. Once European nations secured African territories, they embarked on a system of governance that enforced the provision of natural resources— with dire consequences for people and the environment. Resistance to colonial rule grew steadily and between 1950 and 1980, 47 nations achieved independence; but even with independence the problems associated with the slave trade and colonialism remained. The introduction of Christianity and the spread of Islam in the 19th and 20th century also transformed many African societies and many traditional art practices associated with indigenous religions declined. In addition, as imported manufactured goods entered local economies, hand-made objects like ceramic vessels and fiber baskets were replaced by factory-made containers. Nevertheless, one way people made sense of these changes was through art and performance. Art plays a central role, particularly in oral societies, as a way to remember and heal. As African artists began catering to a new market of middle-class urban Africans and foreigners, new art-making practices developed. Self-taught and academically trained painters, for example, began depicting their experiences with colonialism and independence; as fine artists, their work is largely secular in content and meant to be displayed in galleries or modern homes (for example, see the work of Cheri Samba, Jane Alexander, and Tshibumba Kanda-Matulu). The diverse and complex systems now at play as a result of globalization are having a profound impact on Africa. Some scholars argue that globalization will have even greater consequences than the slave trade and colonization in terms of population movement, environmental impact, and economic, social and political changes. Whatever the result, these stresses will be chronicled by the continent’s many brilliant artists. Judith Perani and Fred T. Smith, The Visual Arts of Africa: Gender, Power, and Life Cycle Rituals (Prentice Hall, 1998) p. xvii. Cite this page as: Dr. Peri Klemm, "African art and the effects of European contact and colonization," in Smarthistory, September 14, 2018, accessed April 22, 2019, https://smarthistory.org/african-art-and-the-effects-of-european-contact-and-colonization/.